Hello lovely Friends! Friday is only a day away and I hope you've been having a great week so far. Let me share with you today about sleeping wear. Lovely housedresses are staples in my wardrobe. Once I get home, I always change from my go out outfit to something more comfortable such as a housedress. Considering that my family will be seeing me wearing a lot of these, I always make sure that my housedresses are reasonably attractive and clean and nice looking. I mean, look at these! Aren't they just lovely and festive looking to be worn at home? I want my husband to come home and find the house presentable AND me looking presentable. I love wearing housedresses at home, because, well, they make feel at home. They create a distinction between the outside world and the little refuge my family called home. They are comfortable to wear, sturdy, feminine, and enable free movements because they are long enough to cover my knees and have short sleeves. I can run after my toddler, kneel down, pick him up, clean, cook, and do any other things with relative ease in one of these. They are much more comfortable than wearing jeans or tights and very low maintenance, too. You can just throw them in the washer with some laundry soap, and they will turn out clean and nice smelling. Besides, they are reasonably inexpensive, so I can wear them out without afraid of spills and housework. When a particular housedress has become dirty or shabby looking beyond any cleaning, I just cut them into pieces for rags, and get some new, fresh, pretty ones. Of course, when I have company or guests, I would change into something more appropriate! However, a housedress is a housedress. Though I try to wear housedresses in cute tiny prints and cheerful colors like the picture above, with all the piping and the trimmings and the detailing, they still look like a plain, shapeless, knee-length dresses. Fyi, I also use them as sleeping wear. I only wear new, fresh, clean ones to bed, of course. Still. They're not enough "eye candy" for the man whom I'm married to, I guess, because one evening he said to me: "Honey, why don't you wear something a little bit sexier to bed?" "What do you mean sexier? Like lingerie? Honey, you know I cannot stand the cold of the AC, and you always want to sleep with low temperature. I will catch cold if I wear something skimpy for sleeping in!" "No, I don't mean lingerie, " Hubby explained. " I mean one of those cute, modest nighties that they sell at the department stores. You know, the silky looking ones in pretty pastel colors?" Something like these... No, not lingerie. Just something... sexier. And much more beautiful than my usual sturdy housedress that I wear to bed. Find similar pink nightie here. Find similar nightie with ruffles here. Find similar baby blue nightie here. 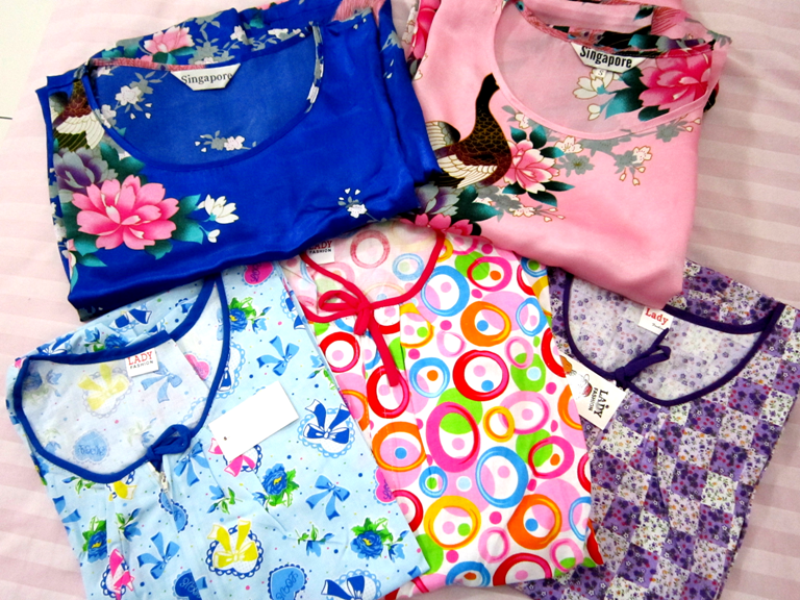 Rummaging around my dresser drawer, I found three pairs of nighties in beige, coral and lavender colors. Well, that's a start. The next day, I went shopping for some new ones, and I got three in these lovely pastel colors and cute patterns of polkadots and flower garlands. A side note, these are not expensive. They cost just similar to my cotton housedresses. coral nightie here, baby blue nightie here, and polkadot nightie here. I started to wear them everynight after 8 pm to go to bed, and boy, I should have acquired this habit a long time ago! The nighties are actually not silk, just nylon material but with subtle sheen finish to it. They feel nothing like my common cotton housedress! The material feels silky satiny smooth, cool and nice touching your skin. I wore one, and suddeny I felt feminine, delicate and girlie. It makes me feel special to wear something so fabulous and beautiful to bed. I felt like a glamorous 50s movie star! It's such a delightful and luxurious sfeeling. And my husband? Boy, he just loves it! Totally. He said the material feels cool and nice to touch when he holds me before we both falling asleep. He said it gives him such a good feeling to wrap his arms around such a glamorous woman prior to sailing to slumberland. Haha! Now I keep my nighties tucked in safely with a scented soap to keep them smelling sweet and lovely. I am determined to wear them everynight. Not just for my husband, but also for myself. I now realize why I had only kept my good sleeping wear in the dresser drawer for years and continue to wear housedresses to sleep in. I felt like I needed to justify myself to be wearing something so beautiful and special for everyday occasions like sleeping. Well, don't you think that life itself is special? Don't you think everyday, each day, is a special gift from God, a special opportunity to live and work and breath and laugh and love for yet another 24 hours? I don't need to wait for something really special to warrant such fabulous, pretty nighties to bed, because everyday is special! Do you have a beautiful china tea set that have been sitting in your cupboard, collecting dust for years? A special branded purse that you have rarely worn because you are afraid you will spoil it? An exquisite leatherbound journal that still sits empty in your stationery station on your working table that you think is too pretty to use? Well, wear them, use them, enjoy them. Because everyday is special. Because YOU are special. Because God wants us not just to live, but to live abundantly. Sometimes when I were at Church and get bored during the sermon (shame, shame, but yes, it happens! ), I would people watch and noticed the clothes people wore. Then I would think to myself that the clothes were not only of a variety of colors, but also rich in different textures, patterns, and style. God made fabrics not just as something to cover us up, but also to beautify. God loves beauty. That's why He created such a beautiful planet for us to live in, with all the glorious mountains and rivers and oceans, all basking in His glory and beauty. What about food? If it's only something to sustain us and give us energy, why not just an energy bar or a tablet? Why there are different textures and spices and herbs and enticing smells and colors and textures? God does not just provide us with bare bone necessities of what we need, but He gives what we need in generous, bountiful abundance. Same thing and analogy with the nighties, I guess. I could choose to wear some old, tattered, baggy T-shirts to sleep in. They would be extremely comfortable, I imagine! I could choose to wear sturdy, practical, cotton housedresses, like I usually did. I can go further and wear these lovely glamorous nighties and feel fabulous and luxurious and exquisite while having my beauty sleep! Of course, it's all up to our preferences and circumstances. So please don't go out now and spend a ton of money on Victoria's Secret silk pajamas! And please don't wear nighties if it's not something that you are comfortable wearing or your husband won't like seeing you in! However, if you do have some pretty things in your house that you rarely wear, I urge you to make use of them. They won't do anyone good just sitting there collecting dust! and have it more abundantly." Thanks for sharing with Visible Monday! Anything that makes you feel like a 50s movie star is good in my books! this was awesome to read!! I love slipping into something comfortable myself!! Love the nighties you picked out as well! These are so cute! Thanks for the tip. Wow! Both the housedresses and the sleepwear are really lovely! Posting through Make My Saturday Sweet. I got your link from Style Elixir. I've never owned anything luxurious to sleep in. I tend to just sleep in a vest. I have to say though I love the feel of silk and your pictures make it really tempting. Love the bible verse too, one of my favourites! I am now following you on bloglovin. I will leave my link. But please no pressure. Those nighties look really comfy! Thanks so much for linking up to the Be.You.Tiful Link Party! Excellent post. This should be mandatory teaching for younger wives from a Titus 2 "aged woman." We should listen to what's going on in our good husband's head, OFTEN. Great thoughts I'm so glad I read. I'm headed off to be your newest follower. (Frugal) Mommies Don't Get Corner Office? A Simple Gal's Journal: The Blue Birthday Diva! A Simple Gal's Journal: Nutella Week!